World authorities, mayors and experts are preparing to debate the New Urban Agenda – a discussion that will reach its peak next year at a major UN conference. These leaders carry on their shoulders the hopes and dreams of millions of people living in unsafe and sprawling cities. It has never been more urgent for the international community to tackle rising challenges in the megacities of the developing world, especially as some of the most unstable regions are going through unprecedented urban population growth. Yet a crucial aspect of contemporary urban life has been missing from international discussions: security, specifically, how to create urban policies to address the armed violence that has plagued life in megacities across the developing world. Insecurity – in the form of crime, gang warfare and terrorism – has a direct impact on the developmental potential of cities and their populations, which now account for more than half of the world’s population. It is time to address comprehensive responses to urban violence by bringing security and development together. Different cities are affected by different armed actors with their own drivers and agendas. But there is growing evidence that overcrowded and sprawling cities are more likely to be afflicted by protracted violence. This tends to be the case in developing countries where the state has been overwhelmed by the scale of urbanization. 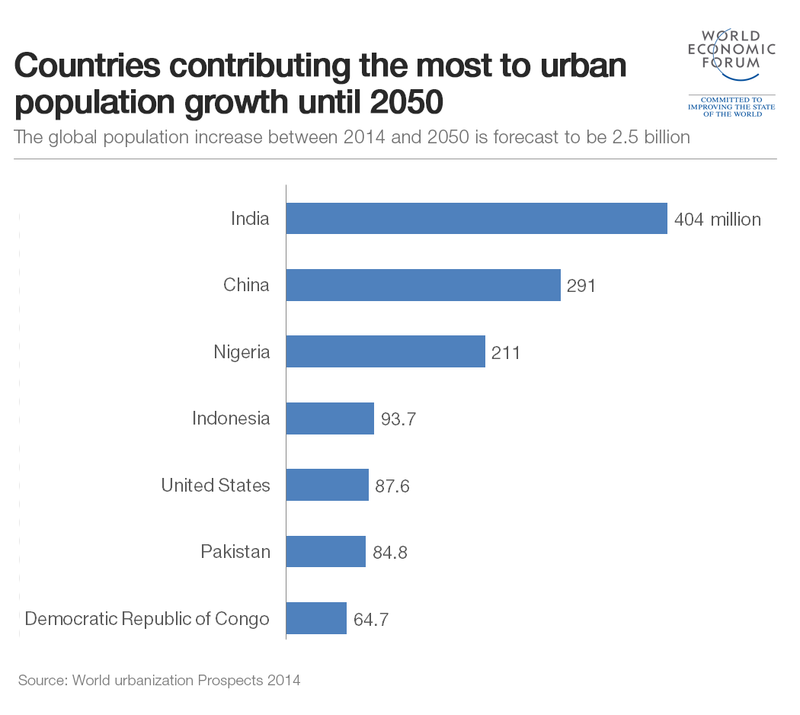 Africa’s urban population is forecast to triple and Asia’s to grow by 61% by 2050, according to the UN. The consequence is what UN Habitat calls a global wave of “peripherization” – sprawling areas or slums with informal land arrangements, often marginalized and insecure. The world’s slum population is already at 863 million and, according to the World Bank, is forecast to increase by 500 million people by 2020. The UN Population Fund has warned that, in coming years, developing countries will need to build new urban infrastructure faster than in previous centuries. Some cities – or specific areas within them – have become hubs for violence, where goods, people and weapons are smuggled. These hubs receive illicit goods that are easily concealed in containers amid the growing trade flows criss-crossing the developing world. They also receive displaced and young people in search of (often elusive) job opportunities. Sprawling megacities – those with 10 million or more inhabitants – are increasingly located in areas containing many of these elements. Karachi, in Pakistan, receives and processes a large share of heroin from the world’s largest producer, Afghanistan. Criminal violence in Rio de Janeiro, Brazil, and Cape Town, South Africa, is linked to the large flows of drugs going through both countries (including increasingly for internal consumption). Cairo, the Egyptian capital, has seen a surge in the trade of small arms smuggled from Libya since the fall of Muammar Gadhafi in 2011. The case of Nairobi, Kenya’s capital, illustrates the rising nexus between armed groups and urban sprawl. Somali terrorist group al-Shabaab staged a bold attack against the city’s Westgate mall, where 67 people died in September 2013. The slums that account for over half of Nairobi’s population have seen their marginalized young dwellers being drawn to the extremist group due to a combination of poverty, police brutality, insecurity over land tenure and Islamist radicalization. Police have increased raids in slums and suburbs after the Westgate attack, resulting in allegations of brutality and persecution against ethnic Somalis. Inhabitants live in constant fear of eviction due to the informal character of slum settlements. Kenyan community activist Kennedy Odede – raised in the Kibera slum – wrote last year that the “perpetual sense of anger” due to urban poverty, exclusion and violence “will ensure that there are always new terrorist leaders to replace those who are killed”. The rapid expansion of some megacities has put a strain on governments’ ability to cope. They are well connected to global criminal flows and chaotic enough to attract armed groups. In Karachi, where the population more than doubled in little more than a decade, authorities have recently reported a more aggressive push by the Taliban to link with criminal gangs, conduct extortion and kill police officers. Violence is not new there, but the population spike has contributed to the proliferation of criminal groups. As Pakistan’s largest city and key maritime trade hub, Karachi is an example of a large economic centre being held back by urban violence. It gained 11 million new inhabitants between 1998 and 2011 – an increase of 115% – according to an official census (the population is now 21 million). It has earned a reputation as one of the world’s most violent cities, where conflict, overpopulation and lack of planning go hand in hand. Megacities such as Nairobi and Karachi are crucial for the economic development of the countries where they are located. Urban industrial and service-sector activities are as important now for emerging economies as they were in the last few centuries for the rise of Europe and the United States. If cities are to continue to serve their historical role as hubs for growth and innovation, not violence, new policies have to be tried. Law enforcement authorities often deal with gang warfare, organized crime and urban terrorism on a case-by-case basis, in isolation from other dimensions of urban life. This leads to inefficient policies: heavy-handed tactics that fail to tackle the absence of the state in slums, lack of transportation for fragile communities and youth unemployment affecting those most at risk of gang recruitment, to cite just a few sources of urban fragility. Whereas talks on sustainable urban development have focused on land regulations, design and population density, authorities and experts have never fully embraced the issue of organized violence as a cross-cutting challenge in modern cities. Discussions such as the UN’s Habitat III conference next year, aiming to encourage urban development, risk being severely handicapped by the absence of any direct discussion – or even mention – of urban violence. But some cities have been forced to act, with surprisingly positive results. After Rio de Janeiro was chosen to host the 2016 Olympic Games, city and state authorities embarked on a pacification programme to impose order on its lawless favelas (slums). Rio had suffered for decades with gang warfare. Faced with the high-stakes challenge of securing the slums for the upcoming mega sporting events, local authorities focused on reinforcing state security presence and implementing development programmes in those territories. The use of force to expel criminal groups from their old turfs was followed by development and infrastructure projects. It was the first new strategy on urban security in Brazil for decades. As a result, the main criminal groups were declared permanently weakened and in retreat. Homicide rates plunged. Rio’s pacification, however, also displays the complexity of joining security and development policies. The programme is labour-intensive and expensive. It now faces a counter-attack by heavily-armed gangs during a time of cuts in public expanses, with Brazil’s economy forecast to contract this year. Nonetheless, it remains one of the most innovative security policies in urban areas in the world. Cities in Africa and Asia face similar pressures. Examples such as Rio and Medellín, in Colombia, which has also achieved results with a combination of security and development tools, should be studied more closely by countries facing rapid urban growth. For too long municipal authorities have considered urban violence as something to be merely repressed with the use of force. As the international community prepares to debate urban solutions in a new development agenda, it will need to consider how to make cities safer in order to harness their economic potential. Author: Antônio Sampaio is a Research Associate for Security and Development at the International Institute for Strategic Studies. Image: Slums are seen along a river with the skyline of Makati, Manila’s financial district, in the background. REUTERS/Cheryl Ravelo.